Cologne – With the Bundesliga 2 season now underway, it can safely be said that football is back in Germany. The Bundesliga clubs are back in official action in just three weeks, and they are increasing the level of intensity to get them sharpened for the season start. Well, that'll be that from bundesliga.com's live updates on this Sunday. For now, we'll leave you with these messages from a pair of the Bundesliga's finest Brazilian full-backs - and don't forget to join us bright and early for all that's moving and shaking in the German top flight. Gute Nacht! Stuttgart's South Americans look a happy pair this evening. It was a disappointing afternoon for Ricardo Rodriguez and the Wolves in London, with Arsenal beating the Bundesliga runners-up 1-0. This is an amusing tweet from the Brazilian centre-half. Bayern's Latin crew look chilled out. "Despite the rain, plenty of fans are waiting," VfB Stuttgart have tweeted below. "Our head coach is hard at work signing autographs!" Markus Gisdol's side are training at 10 AM and 5 PM tomorrow, according to the club's tweet below. VfB Stuttgart eased to a 4-1 win over FC Winterthur courtesy of a brace from Daniel Didavi and goals from Timo Werner and Daniel Ginczek. Franco Di Santo's move from Werder Bremen to Schalke was one of the main talking points this weekend. Follow the link in the tweet below for more on that one. "The players are giving some final interviews before departing for the airport and heading home," reads Wolfsburg's tweet below. Hannover 96 and Hull City have drawn 0-0 in Zell am See. Stuttgart two goals to the good at half-time. "After a good training camp and two friendly victories, the new season gets underway in four days," writes BVB's FIFA World Cup winner Matthias Ginter on Instagram. "I wish you a lovely Sunday and a good start to the week tomorrow!" Marvin Plattenhardt and Roy Beerens went for a bike ride in their free afternoon. "After an intense training camp with lots of hard work. as well as two wins, today we went home," wrote Kevin Kampl on Facebook. "Thanks for the hospitality and the lovely seven days, Switzerland! Here's to a succcssful season. Best wishes for a lovely Sunday." "Home again," reads Köln's tweet below. The men from Lower Saxony went down 1-0 to Arsenal this afternoon, despite a good display. Stuttgart's Aussie goalkeeper Mitch Langerak is keeping the fans happy. A nice little play on words from HSV's Twitter account (below), as they confirm that Chilean midfielder Marcelo Diaz has returned to the northern city after his heroics in helping his country win the Copa America. Bayern star Holger Badstuber has been spending a relaxing Sunday out on his bike. Schalke have just tweeted another great picture of Franco Di Santo after his first training session with the club. The Wolves have gone a goal down to Arsenal; Theo Walcott netted the opener for the Gunners. "We're about to get back underway in London." Arsenal FC 0-0 VfL Wolfsburg. A good half from the Bundesliga runners-up. "First training for Franco as a Royal Blue," reads Schalke's Instagram post below. Hannover 96 have shared the following link; you can watch the pre-season friendly against English side Hull City AFC with Felix Klaus, Mevlüt Erdinc and Co all involved. The Swabians face FC Winterthur this afternoon - Geoffroy Serey Die has been rested due to a minor thigh problem. "Wonderful panoramic view here at Zell am See and soon we'll be underway between Hannover 96 and Hull City AFC," reads die Roten's tweet below. "Departure!" reads Köln's tweet below. We'll keep you updated on how the Wolves get on. "15 minutes until kick-off," reads Wolfsburg's tweet below. "The warm-up's underway." Dortmund's dynamic duo, Marco Reus and Pierre-Emerick Aubameyang, meanwhile, inspired die Schwarz-Gelben to victory over Juventus last night. Recap that one here. The second-half action in the Bundesliga 2 is about to get underway. You can follow all the entertainment live here. "The team have arrived at the Emirates," reads Wolfsburg's tweet below. The Effzeh boys are heading back to North-Rhine Westphalia. "All ready to go in the Emirates changing room," reads Wolfsburg's tweet below. "The Wolves can come now!" The Lilies are doing ten against ten in a practice session, according to the tweet below. 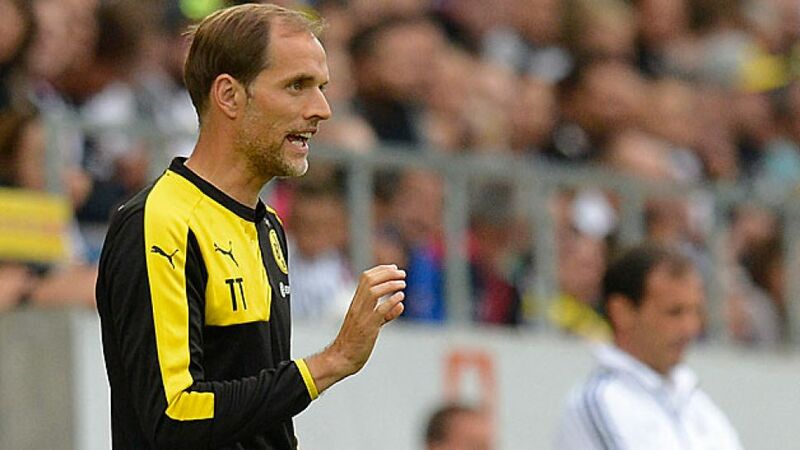 Dortmund face Wolfsberger AC on Thursday night in the UEFA Europa League. "Arrival at Salzburg airport," reads 1. FC Köln's tweet below. "The boys will be taking off for Cologne shortly." VfB Stuttgart are currently gearing up for their final pre-season friendly. 1. FC Köln are still building up those muscles as they break a real sweat on their final day in Kitzbühl. Hertha Berlin weren't overly successful from set-piece situations in 2014/15, but if this strike from Jens Hegeler is anything to go by then that may change next season. Borussia Dortmund are heading home after an eight-day training camp in Switzerland. Perhaps it's not just SV Werder Bremen's Anthony Ujah who struggles with staying afloat in aquatic environments. It seems Salomon Kalou may be eluding to the fact he can't swim either. A behind-the-scenes look at what the FC Bayern stars got up to at the Audi Driving Experience in Shanghai. The Royal Blues are still working hard towards the start of the upcoming campaign. New signing Franco Di Santo is expected to join up with his new team-mates later today. FC Augsburg's players will be hoping they don't have to hop all the way home later this afternoon.